Thanks! I'm not too worried because I still have cap if I need it for now! Definitely feels weird parting with all of it! Yes, exactly what Nev says. You got all this gold, and you spent it on something you really wanted, so now you can enjoy having a very awesome mount, and you still have all these skills to make gold, so give it some time and you'll be as rich as you were before! I'm saving up too for Invincible's reins... though I barely got over the 100k mark, so I like to read your blog and see where I can make some money. I do know that whenever Invincible will turn up, I'll still will be nowhere near the amount of gold that I can spend, but it keeps me going, and it's nice to read stories like yours. I beg you, please. Level up a gnome to 20, and ride him around stormwind on it. Pretty please. It's becoming a problem! I have a lot of bank alts across a few servers, and now I want all of them to be at least level 20! Gotta put that time into making my gold back though, so priorities! I had a similar experience during December. I was sitting at 1.1 million but bought Ashes of A'lar (360K) and Blazing Hippogryph (245K) from the BMAH - over half of my total gold! 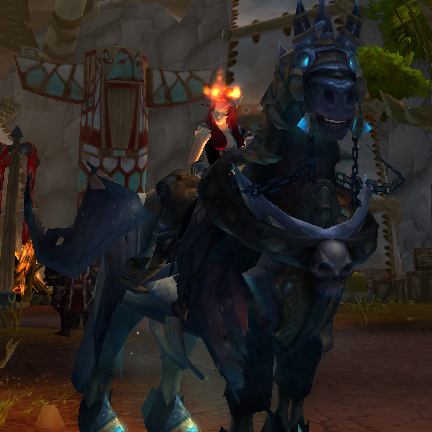 Mounts are my 'thing' in WoW so I was very happy despite the major gold outlay. TBH, I thought that Ashes of A'lar would have gone for a lot more gold and I actually thought that 360K was a pretty good deal! My Guildmaster got invincible the first time we cleared heroic 25 icc during cata. You're a true trader Lewtz! Don't sweat the money, but I'm glad to see that you are somewhat frugal, that's the sign of a responsible money maker.